Former tenants of Oriental City have held a protest against the continued closure of the site, which has been derelict for 18 months. 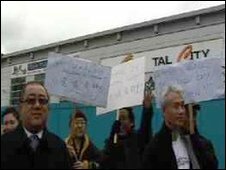 Protesters at the complex in Colindale, north London, waved banners with the slogan "Where is Oriental City?" in both English and Chinese. Oriental City was shut in June 2008 and was due to be demolished to make way for a £450m redevelopment. The developer said the site was now in the hands of administrators. Plans for the complex, which had been dubbed the 'real Chinatown', included a 28-storey tower of luxury apartments, a school and shops. Fai Liu, of the Oriental City Tenants' Association (Octa) said he feared traders would never be able to return to Oriental City. He told BBC London: "They said to us we'd be back in three years. You look at that site today, it's still boarded up. "I get tenants phoning me, I get parents phoning me, I get customers phoning me saying 'What's happening to Oriental City, why is it like this?'" Brent Council said planning permission for the site would run out in June. Oriental City had attracted 10,000 people a week to its shops, restaurants and events before its closure. A spokesman for B&S Property, which had been managing the site on behalf of the owner Nereus Ltd, said the property was now in the hands of administrators and compensation had been paid to many of the former traders.